Quantis Italy is official and our team is growing. 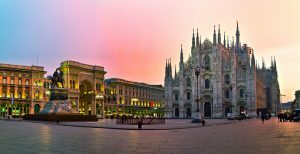 Milano, Italy is the chosen location for our newest office. We are please to welcome Filippo Sessa, who joins the team as Sustainability Consultant and will work alongside our Italian market lead Simone Pedrazzini. The decision to open a physical presence in Italy was made in response to a growing demand in the market for bespoke environmental sustainability solutions and to allow Quantis to work even more closely with our Italian clients, such as Fastweb, Ferrarelle, Ferrero, Lavazza, Nespresso, Sealed Air, STMicroelectronics and Yara. For more inforamation, read our press release in English or Italian. To learn more about our services in Italy contact Simone Pedrazzini.